Shadman Zafar has helped change the way we use our phones for banking. He led development of Citibank’s app and the Zelle money transfer app and is responsible for ensuring both are safe from hackers. The bad guys out to steal clients’ personal data today no longer are just hackers in a garage somewhere. More likely they are part of organized crime, state-sponsored groups, or terrorist organizations. Many work in office buildings and put in regular work hours, in sophisticated coordinated attacks on financial security across the globe. Much of the security operates without you noticing. Before your device asks for your PIN or a two-step authorization code, the app/financial institution already knows your habits: how you hold your phone, how fast you press the numbers, even how fast you walk are just some of the “bio-markers” now noted by phones when people access their secure accounts. It’s all about safety, and not being obtrusive to the customer. “The people shouldn’t know the complexity of keeping them secure,” Zafar says. 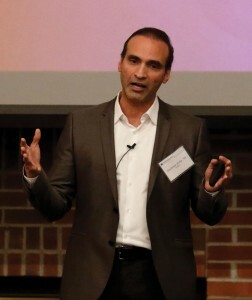 Majoring in mathematics at OWU and completing most the requirements for a dual major in computer science, Zafar was hired after graduation by GTE Laboratories in Boston to work in research and development. Advancing through the ranks, he moved to the business side and joined Verizon when that company was formed out of GTE and Bell Atlantic. Zafar’s not been afraid to go big with ideas in his corporate life. He recounts persuading the Verizon board to invest $24 billion — with a ‘B’ — to build the FIOS fiber optic network for residential customers. In 2011, he moved to London, and the financial side, joining Barclays as chief digital officer, before returning to the U.S. to join his extended family in Dallas in 2014, working at JPMorgan Chase as head of digital products and services, and then Citibank as its global head of digital. Despite his success as a corporate executive, Zafar says he considers himself first to be an inventor and entrepreneur. He holds about 100 patents on inventions in entertainment and media, telecommunications, software engineering, finance and, most recently, in healthcare. He’s also started a private equity firm, a nonprofit foundation, and has a book in the offing about the keys to success in corporate America.